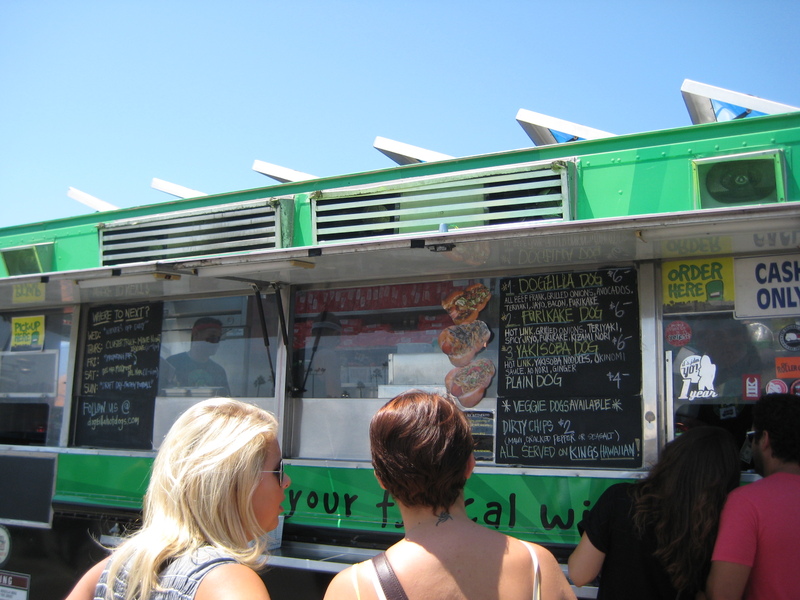 The Del Mar Fairgrounds was the host of the first ever Gourmet Food Truck Festival. It was a gorgeous day out and perfect for gorging ourselves with amazing food. Now as I seat here after some “down” time, I am going through all my pictures and reminiscing about the eat-a-thon with my friend, LA. 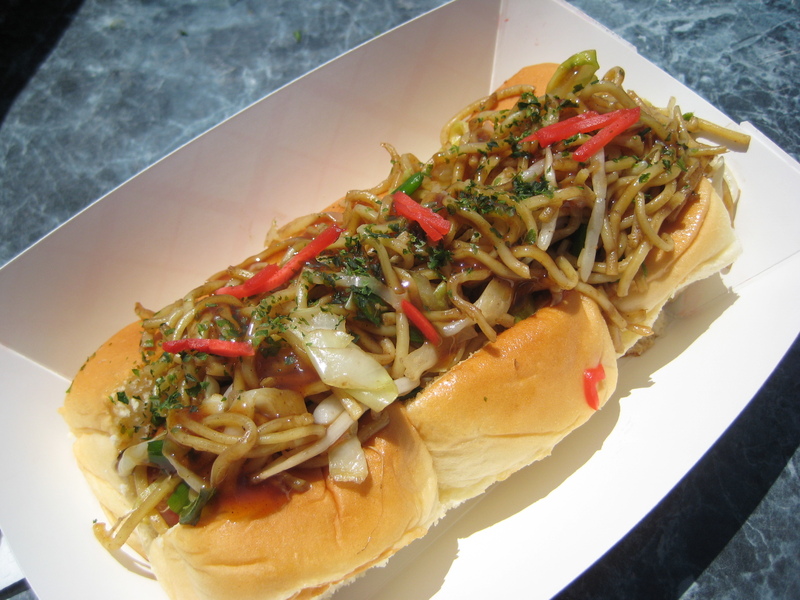 To wet our appetites, we started with the Yakisoba Dog ($6) – a spicy hot link topped with stir-fried Yakisoba noodles with cabbage, bean sprouts, and green onions, Okonomi sauce, red ginger, finished off with Ao-Nori. I was excited to try this because it was everything I love, in a bun! And not just any bun, but a sweet Hawaiian bun. 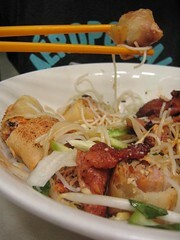 The sausage gave the meal the spicy kick I prefer my meals to have. With the lack of Sriracha and only ketchup, the sausage provided that spiciness that made my tongue happy! 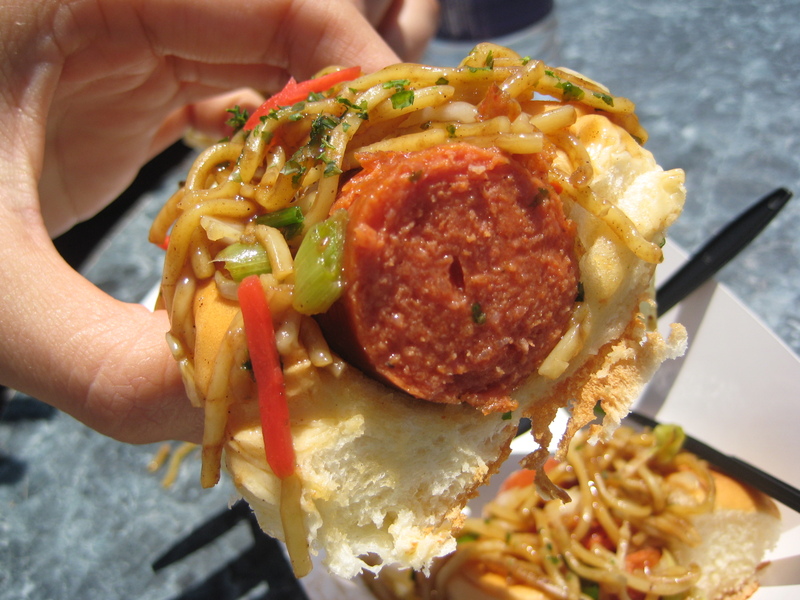 The yakisoba was good, slightly sweet and salty, and the sweet bun helped wrapped everything for mobility. I think this was one of the best starter for this food adventure! Specializing in well…great balls! Of meat :). While waiting in line, we talked with two fellow foodies and had a great conversation with them! As LA said, I make friends where ever I go and you know what? Food always tastes better with great company! 🙂 Also, during our conversation, LA came up with a perfect phrase that even our new friends found to be quite amusing, and reflected myself perfectly – “food stalker”. There needs some definition to go with this new phrase….here’s a shot: a food stalker is one who stares at others, known and unknown, solely to drool/obsess/investigate food that is not at one’s own plate. Who will ask many questions to inquire about the food item being consumed and occasionally proceed to request for some. Maybe that’s what a food stalker is? If anyone has a better definition, send it to me! For now, under this definition, I am a bona fide food stalker extraordinaire! This bona fide food stalker and her accomplice went for an order of the Ballywood and Buffalo Balls (respectively and $6 per item). 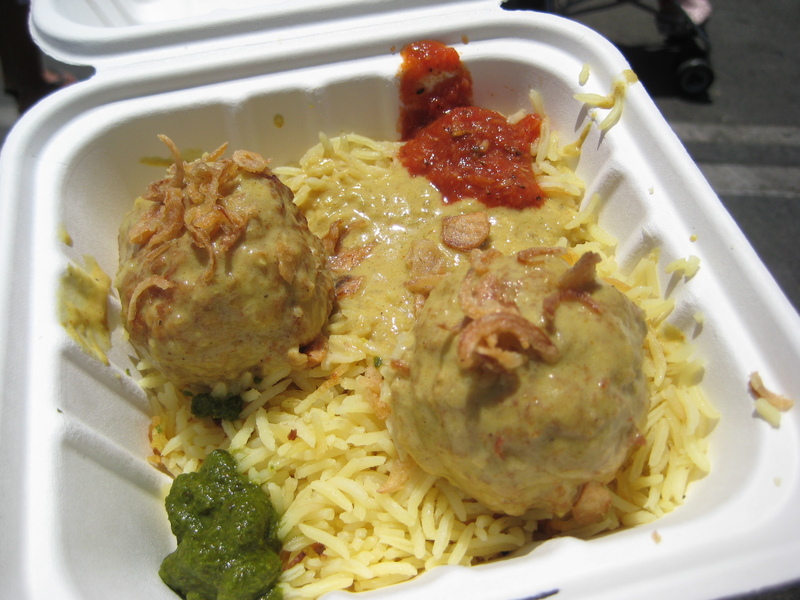 The Ballywood was garam masala chicken balls, topped with coconut madras curry, crispy fired onions, and served with saffron basmati rice with tomato and cilantro chutneys. 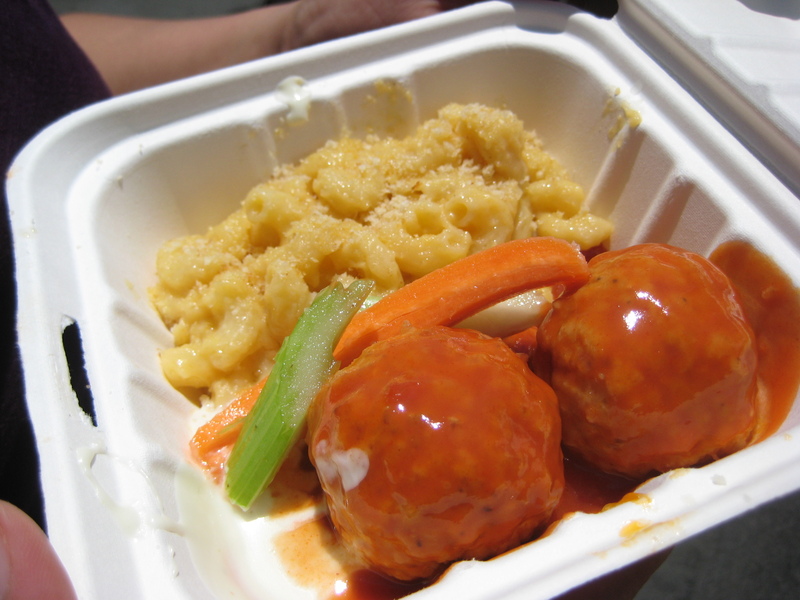 The Buffalo Balls were buffalo style chicken ball, mac & cheese, blue cheese dressing, and served with celery and carrot. The meatballs were amazingly juicy and tender – both of them! The curry was not spicy (how I like mine), but rather on the sweet side. However, it was flavor packed and I couldn’t help but lap it all up (my half) along with the somehow decently cooked basmati rice! The buffalo sauce on the other hand was not spicy, and was sweet with a bit of vinegar tang. Again, not my usual go-to flavor combo, but the meatball itself was so good, plus when I took a bite with the mac & cheese (with panko bread crumbs at top!!! ), it made for a great bite! Overall – this red, black, and white truck satisfied me and LA. We went for the “Tornado” with cajun seasoning. 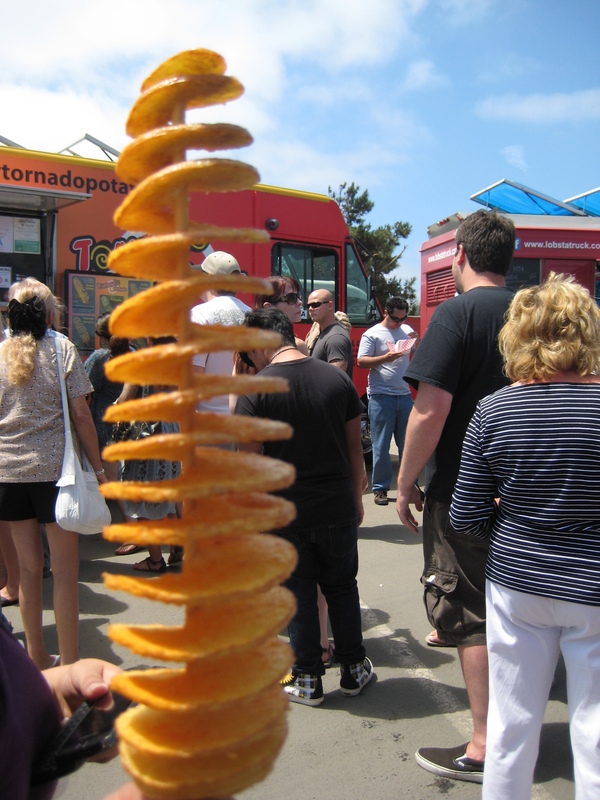 As you can see, it’s a towering spiral of a whole potato on a stick! LA and I had this at the County Fair this year, but we both wanted a fried potato item so we went with this place! We both agreed that the potato should be sliced thinner to get that crispiness of a chip on the exterior, while remaining fluffy inside like a fry. It was still tasty and we both love our potato treat! Having had so many savory items, plus with the sun baring down on us for sometime now, we both needed a cool off and something sweet. The answer to our prayers? 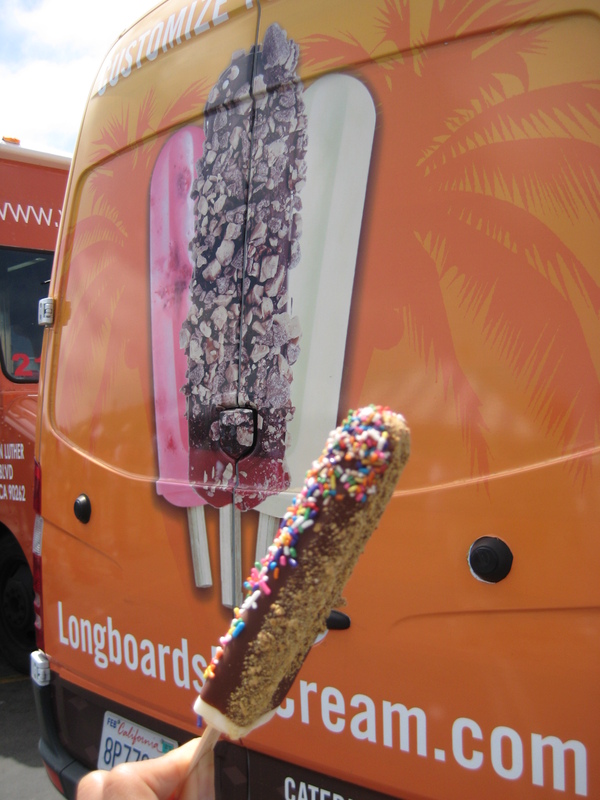 The recipe of this truck is simple: pick your ice cream flavor on a stick, then your chocolate coating choice (milk or dark) and finally your topping to coat the whole thing. 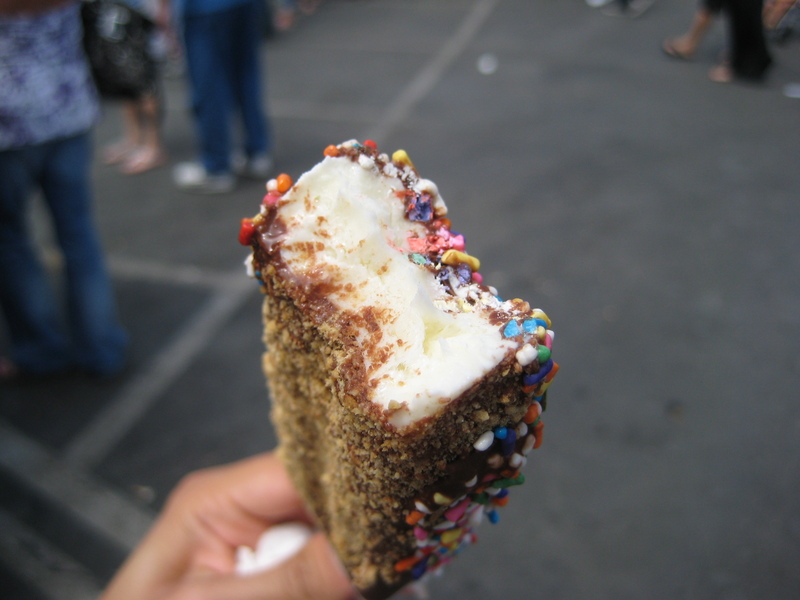 My choice: coconut ice cream, dipped in dark chocolate and topped with half graham cracker crumbs, and half rainbow sprinkles. 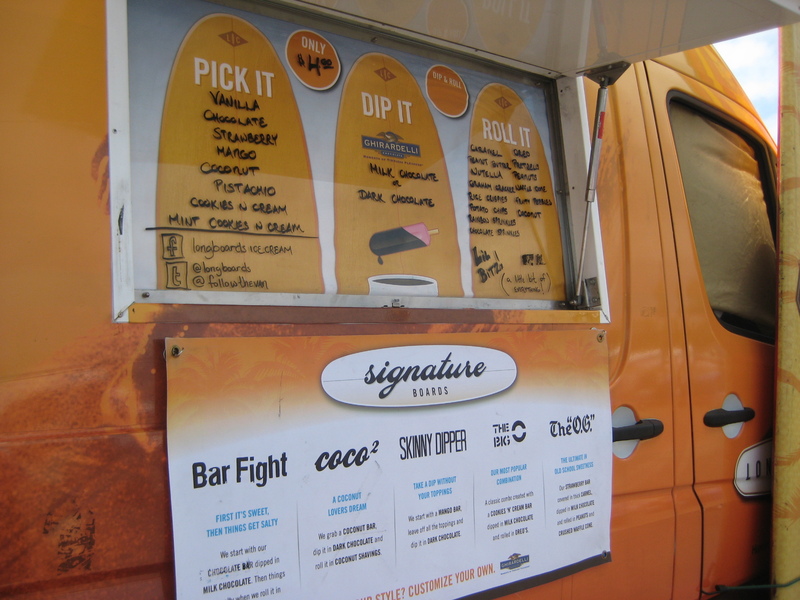 I loved the idea of how this worked and I loved the freshly dipped items, but my only issue was that ice cream bar on the stick was too icy. It must be from keeping the ice cream frozen in order to dip them, so I can understand yet it did bother me a little. However, it was still quite enjoyable! Oh! And since I forgot to take an individual pic of LA’s pop, she chose: pistachio ice cream, dipped in dark chocolate, and covered with rainbow sprinkles. According to LA, the pistachio ice cream was only ok and didn’t have enough pistachio flavor to it. After our pops, we decided to sit and rest for a bit, to let all the food mix in our stomachs and begin to really process it. That was when the food coma started creeping in! Oh man…I knew from there, it was only going to go downhill. However, after sitting, then walking, and watching a race, we dove back into the crowds (which only grew even larger at that point). I met up with a couple of friends and a colleague, watched what they ate and decided I had to make one more last haul! I ordered the Pork Longanisa Bowl with garlic fried rice (sinangag), an egg, and a side of papaya relish (atsara) with tomato and cucumber. Man…when they say garlic rice…boy, oh, boy…did they really mean it! The rice was packed with garlic and I loved it! Their longanisa was sweet, which surprised me a little because I was expecting something spicy (are you noticing a trend here?…because I am). The meat was super tender and yield to a plastic fork with ease, so it was still quite good. Though it didn’t blow my mind away. 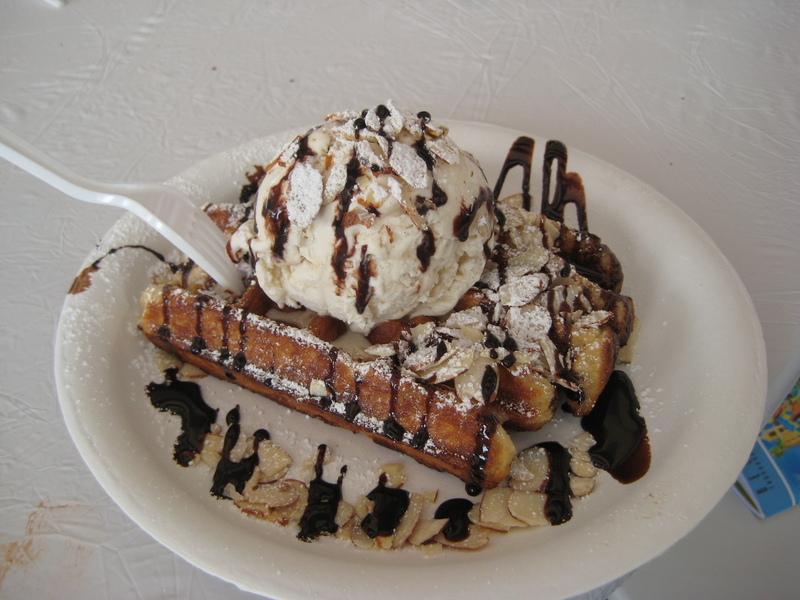 This here is a liege waffle with chocolate drizzle, almonds, and topped with a giant scope of Fosselman’s English toffee nut ice cream. I only had the ice cream and it was amazing! My friend “Channy” dove into this with a huge smile on her face. Judging from her expression, I think she liked it ;). Well my friends, that was my first ever Gourmet Food Truck Festival! I can’t wait for the next one, but until then…I am going to start having to find these food trucks around town for lunch! Bon appetit my fellow food stalkers! I eat a lot…I just realized how much I eat. And if I have enough people to come eat with me…I turn our dining excursion into a sampling of whatever restaurant/place we are eating at. I actually prefer to do it that way since I am one of the most indecisive person you will EVER meet when it comes to food. One minute, I’ll be craving for Thai food, then Mexican next, followed by a sudden urge for Greek, and then maybe perhaps the non-distinguishable American cuisine just because. How can a girl be so fickle?!?! I don’t know either and I’ve been asking myself this for years. I’ve been eating around and I’ve been taking like a gazillion pictures, but lazy busy me has not done a single post on ANY of the meals that I’ve so enjoyed. That is why I will be making a 3 part rehash of what has entertained my palate to my delight. …actually make that TWO. Top to bottom: pork meatballs and pork sui mai. 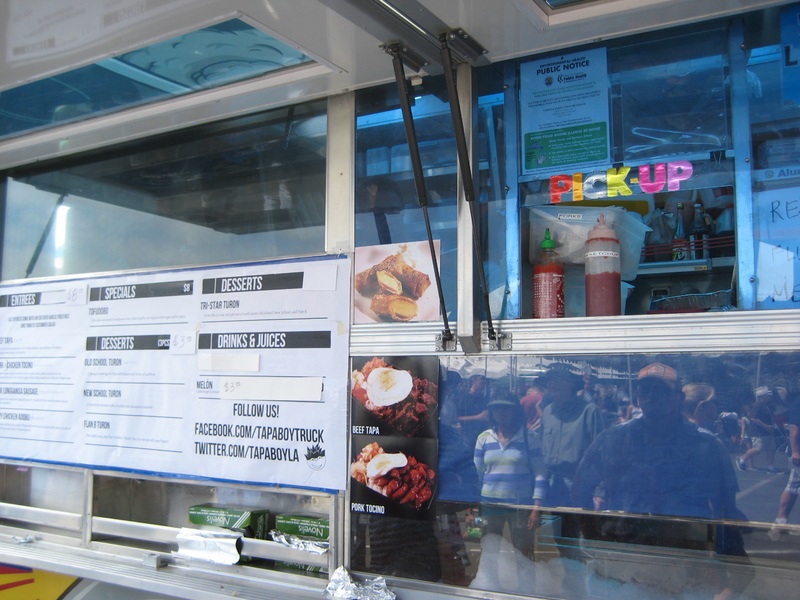 Between the two offerings on a stick…the meatballs won by a long shot! So let’s start with the loser: the sui mai. I felt that the sui mai was just the same, but more bland meatball that was wrapped in wonton skin. And since the woman who got me these puppies went and heated the sui mai in the microwave, it probably was sitting on the “steam tray” for some time. Did I feel like I wasted my money on this one? Why yes…yes I did. Thank goodness the meatballs came and saved my lunch day! These little unassuming beauties packed just the right flavors that I remember oh so well of a family friend of ours, who is Vietnamese, and they make some mean skewered pork when they throw parties. The meatballs were well seasoned, the saltiness was balanced with the sweet sauce that was squirted on it, and the chili sauce gave it a spicy punch that I just couldn’t get enough of! I love spicy foods to the point where I don’t think it’s quite that healthy but you live only once right?! The meatballs did have fillers of vermicelli and carrots, but I think this helped make them less dense, thus easier to eat. MmmMm…good! My little sister was craving some Bun with eggrolls; and after walking with me around the dining area, she still could not decide which place she wanted her noodles from so I just decided for her by sitting down at a table. The table “belonged” to the stand that was next to the place where I bought my food. A lady behind the counter came with the menu and placed it in front of us when I chose the spot to sit, thus effectively making the decision to eat there. I loved different aspects of each of these 2 buns. 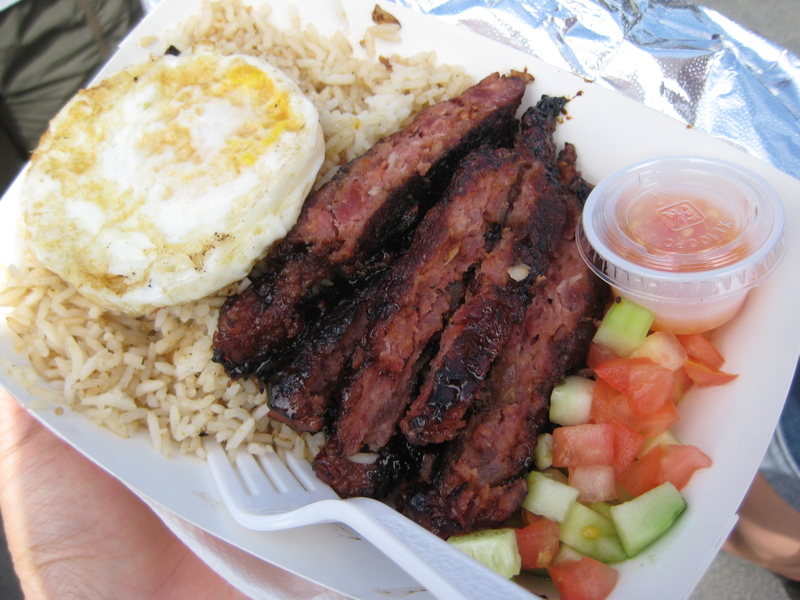 The grilled pork from my little sister’s Bun Cha Gio Thit Nuoung was tender, nicely marinated and was sweet but not too sweet. And my mother’s Bun Bo Hue’s broth was delicious. The broth had so much flavor depth that it reminded me somewhat of my mother’s homemade soups that would take an entire day of simmering on low heat to get all the flavors of the meats and vegetables into the soup. I wish I knew what it was exactly that was in the broth that made it taste the way it did because it was nothing I’ve ever tasted before. I don’t understand flavor, but I know that I loved it. Definitely not your average MSG laden Pho broths. So with our tummies full, we continued to shop throughout the hot, humid day. I hated the weather and cannot conceive why anyone would like to live there other than to have copious amounts of Asian food at their finger tips. That is why towards the late afternoon, while we were in Rowland Heights, I suggested going to Phoenix to have a cool treat. Coconut Taro Tapioca Drink — sounded good, but it was more milk than anything and I HATE straight milk. If I drink straight milk, it will make me sick for the rest of the day because I am slightly lactose intolerant. But what was worse with this drink was that it wasn’t even cold! It was lukewarm milk. UCK! Only after we went and got a cup of ice to add to it, was I able to try a little bit more of it…not that it was any better. Maybe this is how Chinese get their calcium intake – put tapioca pearls and something else in – since they do not usually drink milk on a daily basis (I know, I know! I’m being stereotypical, but you know that this is true for most Chinese yet I know I will hear something about this eventually). Anyways, these cookies were moist, once again not too sweet (seems to be the theme of the day) as coconut cookies/macaroons can be and like everything from that day…it left me wanting more. I think that’s how it is when your palate has been neglected for so many years that when it experiences such explosive and wonderfully blend of flavors, it will leave you wanting more. Yeah, I’m greed and hungry…but eat with me and I’ll share my food if you share yours. But even if you don’t want to, I’ll just reach over and take some regardless. I told you I was greedy, what did you expect?! 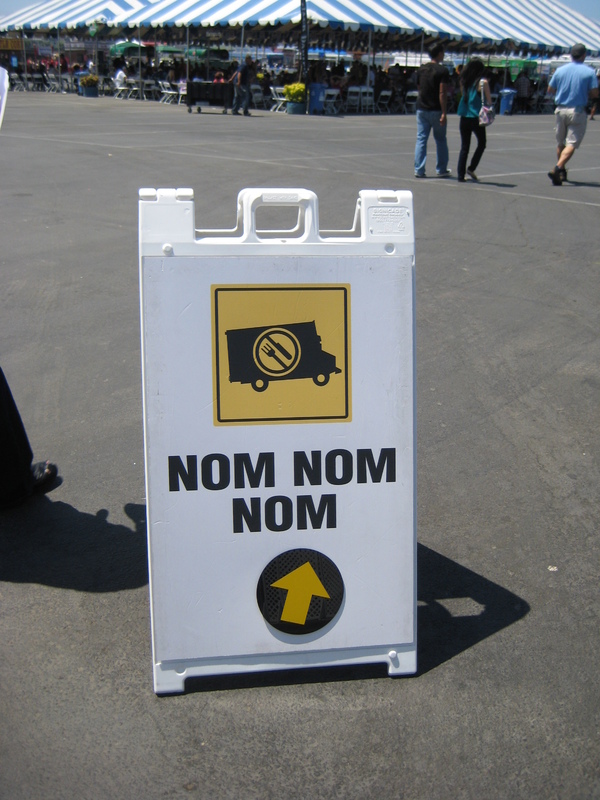 >>Part II-A: Noshing around downtown San Diego.